Adversity develops and reveals character much more than pleasant trips to the beach. That’s just one of the inconveniences of living on Planet Earth. So when your team loses on the road by a field goal to a top five team, what do you do to show the world who you are? For too many Oregon fans, the answer isn’t pretty. Oregonlive’s John Canzano heaped the blame on quarterback Vernon Adams for not being Marcus Mariota, and his followers towed his party line in the comments section. Even after the Ducks’ victory over Eastern Washington, a certain segment of fans was calling for the heads of defensive coordinator Don Pellum and D-backs coach John Neal. It’s a sad fact of life that sometimes things just don’t go your way. Finding someone to blame when they don’t is not a high-character response. Unfortunately, it is the response of too many Oregon fans, and the shallowness of this response is the subject of this week’s Three-and-Out. 1. Don’t blame the quarterback. Canzano belabors the point that Vernon Adams is no Marcus Mariota. Maybe, maybe not. No, Adams didn’t just complete his third year starting for the Ducks and he didn’t just win the Heisman. But let’s be fair. How did Saint Marcus do in his first road game? After having an entire redshirt year to learn the system and four home games to get his footing, Mariota went on the road for the first time and completed 21 of 32 passes for 169 yards, with one touchdown and two interceptions — against Washington State. And it wasn’t even a true road game. It was played in Seattle and there were about as many Duck fans there as Cougar fans. Adams had a solid opening road performance despite many challenges. On the other hand, Adams’ first road game — after less than a month in the Oregon program and after only one home game — was a true road test against a top five team that boasts a strong defense. He completed 22 of 39 passes for 309 yards with one touchdown and two interceptions — playing with a dinged index finger on his throwing hand and wearing gloves. Adams did miss on some throws, and his passing game did look a bit off. Having a messed up index finger on your throwing hand and wearing gloves will tend to do that. Even still, his first road game compares favorably to Mariota’s — and it was against stronger competition in a much more hostile environment to boot. But for those fans — and columnists — who are determined to live in the past, I have a suggestion. Go be a Huskies fan. You’ll fit right in. 2. Don’t blame the coaches. The Oregon coaching staff is flourishing at the highest level. There is no shame in losing by a field goal to a top five team on the road. 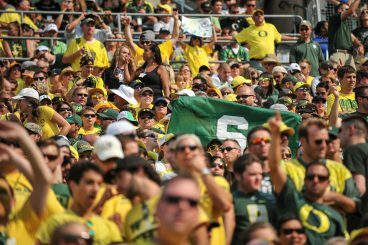 No team in the country has had a tougher stretch than Oregon’s last five games: the Pac-12 Championship, the Rose Bowl, the National Championship Game, a game against one of the top FBS teams in the country, and a road game against a top five team. That’s as high a level of competition as there is, and the Ducks have weathered it well. Results show that Oregon’s coaches are among the best in the country. 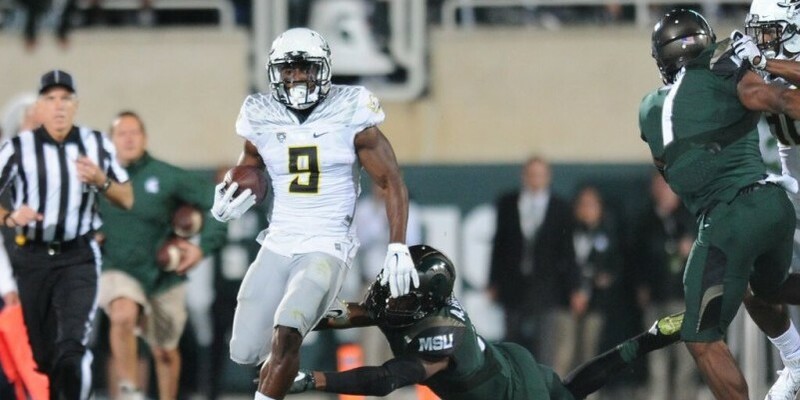 Beyond that, the Oregon staff has coached 28 players who are currently on NFL rosters. Only seven programs have more – and those are all programs that get more than their share of the five-star recruits. The most striking example is USC. There are 32 former Trojans on NFL rosters — four more than Oregon — but considering the ratio of four and five star recruits out of high school vs. the number of players now in the NFL, it’s a safe bet that Oregon’s batting average is closer to a major league hitter’s than USC’s is, and this is a reflection on the quality of the coaching. But let’s get more specific. Fans who think that the Ducks’ defensive coordinator and defensive backfield coach aren’t getting the job done should maybe consider that the two — Don Pellum and John Neal — have developed a lot of talent that has done just fine at the next level. Duck linebackers and defensive backs recently or currently in the NFL include Patrick Chung, Eddie Pleasant, Casey Matthews, TJ Ward, Walter Thurmond, Jarius Byrd, Terrance Mitchell, Kiko Alonso, John Boyett, and Ifo Ekpre-Olomu. 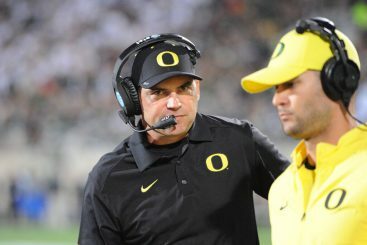 Mark Helfrich is off to a 25-5 start as a head coach, and is likely to pick up a nice string of wins before the next loss comes along. To put it mildly, the Oregon coaching staff’s resume stacks up to be pretty strong as compared to, oh say, the average internet blog commenter who doesn’t have the guts to put his real name behind his work. 3. So, who can we blame? If we must have someone to blame, then people who get worked up over a three-point loss on the road to a top five team — by a team playing with a new quarterback with a dinged up throwing hand — can blame themselves for not taking better care of their emotions. As the old adage goes, you can’t win ’em all. Hidden among the masses are any number of fans who are quick to condemn. The 2015 edition of Oregon Ducks football shows all the makings of a promising year — with or without fans who think they know more than one of the top coaching staffs in the country. Michigan State, on the road, the second game of the year, was a tough draw and in spite of everything, the Ducks darn near pulled it out. The rough schedule that the Ducks have faced over the past five games is about to pay dividends as the schedule lightens up. Now, if a certain segment of the fan base would just lighten up, the world would be a better place.